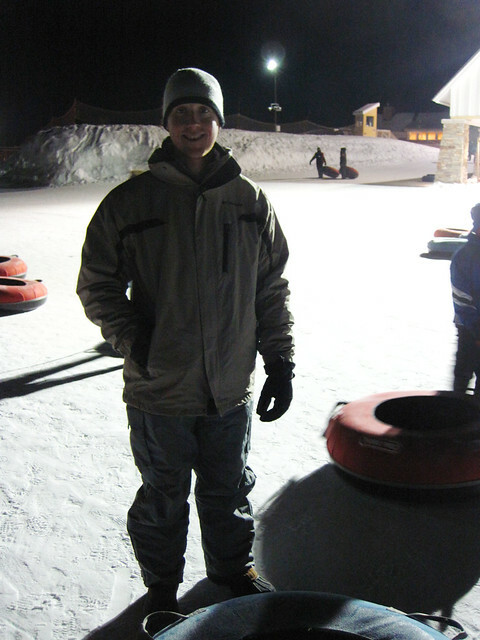 Two weeks ago we met up with our church newly married group for a night of Tubing at Elm Creek Park Reserve (a park in Maple Grove). Kyle and I had both never been tubing so we were pretty curious as to what exactly it was. We met up with our friends about 7:00pm in the Chalet. It was a cold evening... a whopping 5 degrees!!! 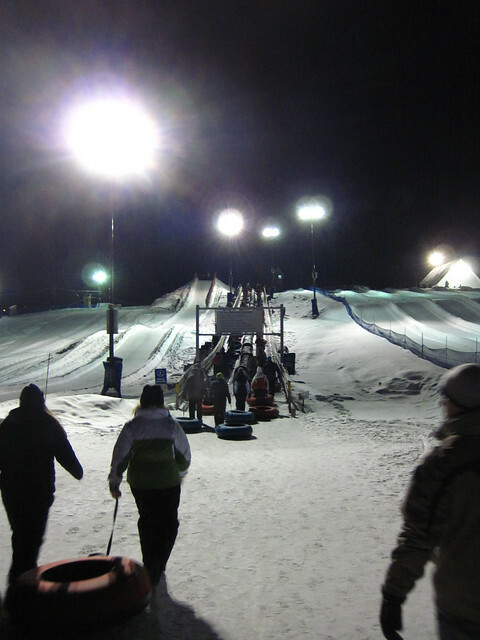 Once we got our 'hill' tickets (since we didn't really need lift tickets) we were off to the hill! We grabbed our tube and walked to the entrance of the lanes. It was almost like those family water tube rides you see at White Water (or for those wondering what White Water is, it's a water park in Branson, I'm sure they are all over - just called something different). We would hook our tubes together so we could go down as a group. 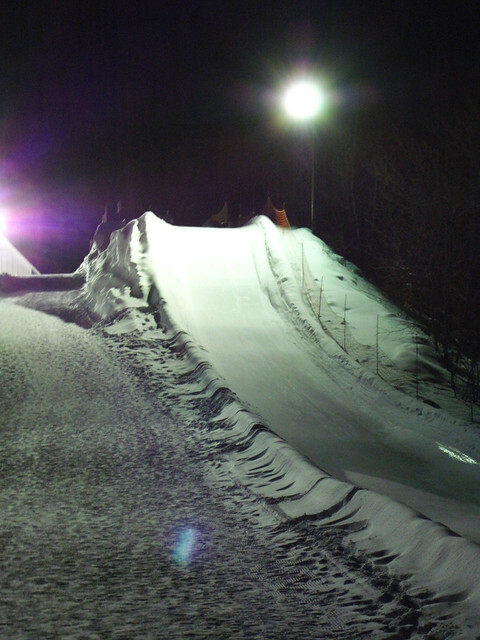 Then once at the bottom we would walk over to the conveyor belt and right it up to the top! They had two big lanes off to the sides. The lane you can see in the above picture to the left of the conveyor-belt was the biggest one. I actually just found out that was the first night it was open, they had just finished making it that day. Then the other big hill was on the other end of the line of lanes. The biggest hill was fun! I only went down it once because at the end they had these mats, like the ones you see in cafeterias to prevent falls, but also offer a padding to the soles of your feet. Well they were 'experimenting' with how to get people to slow down at the end and it was actually kinda painful hitting those rubber mats at the end. So I opted out of taking that hill the remainder of the night. 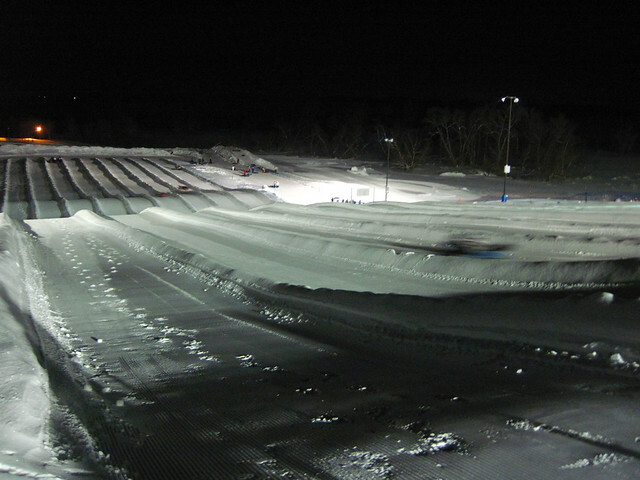 Here is a blurry view of the whole hill. Instead I stuck with the middle lanes and the 'medium' hill. As a group we trained together 8 of us. We didn't link our tubes together with the straps like other times, this time we sat in the tube and linked our legs under the person in front of us arm pits, and like wise with the person behind us, that was pretty fun! Like a roller coaster ride. 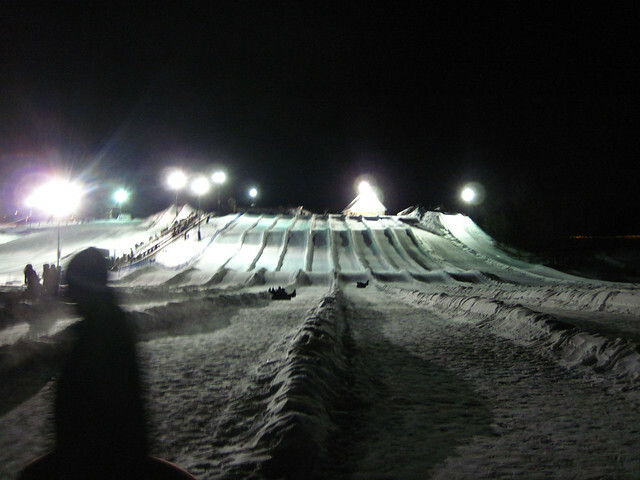 Except when I was in the middle and the landing part at the top wasn't very big so the front few tubes started sliding down the hill while the back few tubes started sliding backwards. Those of us in the middle felt like we were in a torture rack, lol. One of my favorite parts of the tubing experience was seeing a YURT! I couldn't' believe my eyes! I had lived in a yurt for a few months while working at Camp Barnabas during my summer college years. Ahhh it brought back memories. 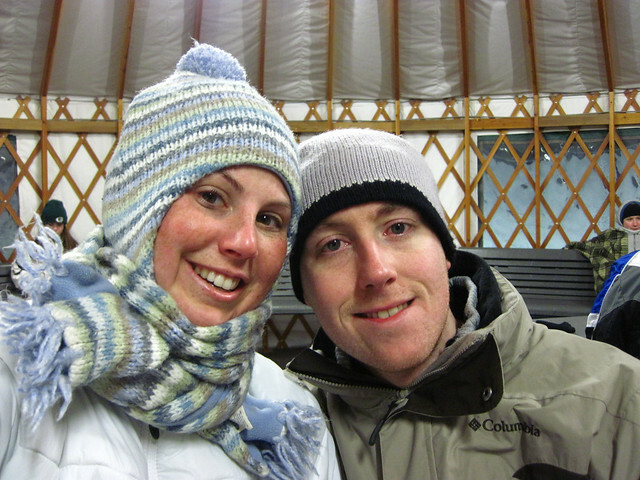 Once we were almost frozen, we headed into the yurt to warm up and I had to re-situate my scarf. It was a fun night! We were out there for about an hour and a half. Our tickets said we had til 9:20 (which would have been 2 hrs of tubing) But they closed at 9:00pm on the DOT! I had icicles on my eyelashes, it was so funny! I tried to get a picture of it in the visor mirror in the car... but that didn't work out. 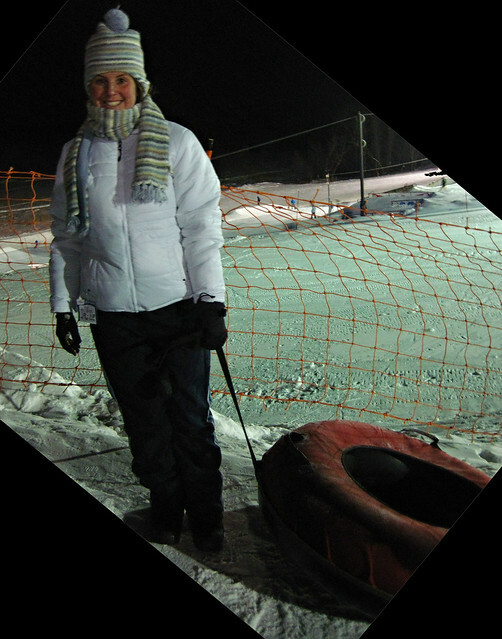 After tubing we went over to one of the guy's house and had hot chocolate and played games :-) Yipee for fun times!